When I ask teachers what their biggest struggles are, one issue comes up on a regular basis: student motivation. You are able to reach many of your students, but others are unreachable. No matter what you try, they have no interest in learning, no interest in doing quality work, and you are out of ideas. For a long time, I had no solutions; the problem was too complex. I have had my own unmotivated students, and I never had any magic bullets for them. Still, the issue kept coming up from my readers. Students are more motivated academically when they have a positive relationship with their teacher. Choice is a powerful motivator in most educational contexts. For complex tasks that require creativity and persistence, extrinsic rewards and consequences actually hamper motivation. To stay motivated to persist at any task, students must believe they can improve in that task. Students are motivated to learn things that have relevance to their lives. To dig deeper into this research, you’ll find a link at the end of this post to a collection of resources that explore current studies on each of the above findings. The research on motivation wasn’t hard to find; it seems as if any teacher with an Internet connection and an hour or two should be able to learn everything they need to know about the topic. So where’s the disconnect? If we as a collective group of educators already know what works to motivate students, why are so many students still unmotivated? When I talk with teachers about the problem, I don’t hear much about the research. Are we passing the buck? Maybe. It’s certainly easier to blame outside forces than it is to make big changes in the way we teach. Unfortunately, even if ALL of the above statements are true, we can’t do anything about those things. The only piece we really have control over is what goes on in our own classrooms. So let’s look at our own practice. When we set aside all the outside factors and just focus in on our time with students, how are we doing? How much alignment is there between our own instructional moves and the research on student motivation? 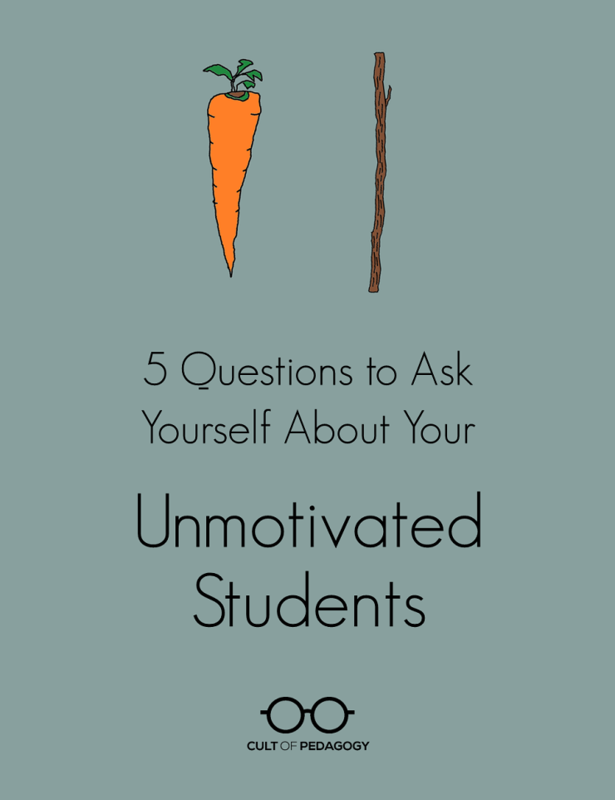 I have put together a list of five questions we can ask ourselves to see if we really are doing everything we could to boost student motivation. To keep me from getting too preachy, I’ll do the exercise with you, reflecting on the years when I was a classroom teacher with middle school students. 1. How is your relationship with your students, really? Multiple studies have shown a significant connection between student motivation and the quality of the teacher-student relationship. A good teacher-student relationship provides students with a sense of stability and safety, which sets the stage for more academic risk-taking. So what kind of relationship do you have with your least motivated students? How well do you really know them? Do you have conversations with them about the things they care about? Or have you more or less given up on them? At first, I’m thinking I did pretty well in this area. I taught English language arts and my students kept journals, so I got to know them well. But when I think about my less-motivated kids, I’m not so sure I can say the same. The connection I had to Andre, one of my seventh-graders, consisted entirely of me getting him to make up missed work. It was all we talked about: the missing work, why he wasn’t turning it in, how important this stuff was for his future. When Andre saw me coming, he probably just saw a looming cloud of nag. We never really talked about the stuff that mattered to him. Smokey and Elaine Daniels’ The Best-Kept Teaching Secret describes how dialogue journals can help us get to know our students better personally and academically. If you want something faster, take a look at the 2 x 10 strategy, shared by Angela Watson, which has teachers spend two minutes a day for ten days casually chatting with underperforming students. Remember that relationships between students matter, too. A well-chosen classroom icebreaker can begin building a sense of community in your room. 2. How much choice do your students actually have? Study after study points to choice as a major factor in motivation. Most of us have probably heard this, but we may not have fully embraced it. After all, providing choice can be messy, with students completing different tasks at different rates, making it hard to be consistent with grading. It can also mean a lot more prep work: If you’re going to give students three different options for an assignment, that means you have to prepare all three options ahead of time. Or do you? Isn’t that kind of prep work more in line with worksheet-oriented teaching, where students are doing low-level work that was largely prepared by the teacher? If students are engaged in more long-term, authentic, creative projects, it’s much easier to provide them with choices, because we aren’t constantly trying to provide them with new busywork every day. I was pretty good about letting students choose topics for writing assignments, but I also required a lot of seat work as well. I wanted students to do their work at about the same pace, and I knew next to nothing about differentiation. Now I’m thinking about Matt, another one of my unmotivated seventh graders, who was incredibly smart. He sat way low in his chair in the back of the Gifted & Talented language arts class he’d been assigned to, way cooler than all the others, and he gave minimal effort. I used the same nagging approach I’d used with Andre, with minimal success. Now that I know more about differentiation and choice, I realize I could have had a conversation with Matt about letting him work ahead on some things. I could have allowed him, and his classmates, more input on the larger assignments I gave them. If I had given Matt a more active role in his own learning, he might have been more engaged. seating: Could students do some assignments on the floor? In the hall? Or just in different seats? work groups: Some students thrive in groups, while others do better on their own. intake mode: If you want a student to read a particular book, and an audio version is available, you could occasionally make that an option. output mode: For some assignments, it may be possible to have students deliver their response in an audio or video recording, rather than in writing. timing: If students don’t absolutely have to do the same thing at the same time, why not let them choose the order of activities they do? 3. Are you relying heavily on carrots and sticks…or Jolly Ranchers? Many, many teachers count on rewards (“carrots”) and punishments (“sticks”) to motivate students. And those who study motivation tell us that extrinsic reinforcement can be motivating if the task is something easy: If you’re trying to get students to clean up the classroom quickly, for example, offering class points toward a party can get them to speed up. But for tasks that require creativity and complex thought, extrinsic rewards actually reduce motivation. In your class, how much of your motivational approach is extrinsic? How often do you use grades, treats, privileges or punishments to prod students into doing something they don’t really want to do, something they have no real interest in? If extrinsic reinforcement is your primary approach, you may actually be killing off any natural motivation students might have otherwise had. I score myself pretty low here. As a teacher, my classroom management was a mess until I learned how to control students with names on the board, extra credit, whole-class rewards for good behavior, and the ever-reliable bag of Jolly Ranchers. I did those things because they worked. But there’s a difference between getting kids to do what you want and truly, deeply motivating them. I’m going to give you a sheet of math problems. The first ten are required, the last two are for extra credit. I’m going to give you a sheet of math problems. The first ten should be fairly easy, but I want to see how many of you can do the last two–those are the challenge problems. You guys have learned enough that I think you can solve at least one of them, maybe both. If you have a tendency to go for the first option, you are going for the easy win, the extrinsic reinforcement. If you find that this doesn’t do much to motivate your underperforming students, try moving more toward the second option and see if anything changes. 4. Do your words contribute to a growth mindset or a fixed mindset? What could be wrong with saying “You’re so smart”? It’s nice, right? It boosts their confidence, no? Well, it’s more complicated than that. Students are motivated to persist at a challenging task when they believe they can get better at it. That requires them to have a growth mindset, a belief that their intelligence and abilities can be developed with effort. Teachers can have an impact on this mindset with the things we say to students. So when we say “You’re so smart,” “You have natural math ability,” or “You’re a great writer,” we are telling the student it’s their natural ability that got them where they are. We’re contributing to a fixed mindset. And that’s not motivating. When I was in the classroom, I knew nothing about growth mindset. I thought kids would feel great if I told them they were smart or talented. I can remember a conversation with Janae, a student who commanded the attention of her peers with ease but got into trouble a lot and did poorly in school. I remember pulling her aside and telling her that I thought she had strong leadership qualities, and that if she could just get her grades up, she had a bright future ahead of her. Yeah, that didn’t work. If I wanted her to “get her grades up,” I would have been better off noticing a well-constructed sentence or complimenting the way she got her group back on track during a cooperative learning activity, showing her exactly what kind of choices she should keep making to be successful. Instead of praising something innate and fixed about a student, focus on specific things students can actually control. So instead of telling a student she’s a great student, notice the level of detail in her lab report. Marvel at the level of difficulty she was able to handle on that challenging math problem. Point out how much preparation she must have done for the presentation she gave. It’s faster and easier to just tell them they’re awesome, but taking the time to be specific and focus on effort will pay much larger dividends. When you have constructive feedback to give, follow the same principle and make it specific. Rather than telling a student she “needs to work harder” on her assignments, tell her what to work on. Is neatness an issue? Does she need to read the questions more slowly? Is she doing the advanced math right, but messing up with the basic addition and subtraction? If a student knows what to work on, she will be far more motivated to do that work. 5. What are you doing to make your content relevant to students’ lives? I think this is another one of those principles that’s been around for so long, we assume we’re doing it more than we actually are. But showing students how the content relates to their lives really does make a difference. When students believe they are doing something authentic, something that will improve their lives or have some kind of impact, they are naturally motivated. So how are you doing in this area? Do you regularly provide opportunities for students to connect what they’re learning to the world they currently live in? Plan it, then say it: Making material more relevant can be as simple as occasionally stopping an activity to explain its relevance. When students are studying the Lincoln-Douglas debates, show parallels with the current presidential election. When you’re studying bacteria, talk about all the places bacteria hang out in students’ daily lives. Making these kinds of connections is a natural practice for many teachers, but if you’re like me, you might forget to add these connections into a lesson. So just add them into your lesson plan; literally write down a few connections you plan to make some time during a class period, then check your plans before class is over to make sure you did it. Design tasks that end with a public product: In one of the videos in the collection below, educator Kathleen Cushman describes the highly engaging work students do at High Tech High, a school whose curriculum focuses on project-based learning. Student projects have an authentic, public end product—a video, a live presentation, a community service project, a website—something that will ultimately be consumed by people outside of their own classroom. This naturally motivates students to work harder on a task. So look at your curriculum and see if you can find more ways to build assignments around real, public products. The purpose of this exercise is not to beat ourselves up. It’s just a way of deeply diagnosing a problem most teachers struggle with. There’s a very good chance that the technology, the parents, or the entitlement are playing a role in what we perceive to be reduced student motivation. But there’s a very good chance that our instructional decisions play a role as well. As an SLP, I have to get students to do what is hard for them all the time. The things that have worked consistently to motivate them is involving them in their own goal setting and progress tracking for specific skills. When they see the data improve, they actually realize the work is paying off. When it goes down, I employ growth mindset strategies to help them figure out what is getting in their way, and formulate a plan to try. When the students “see” their improvement plan worked in the data, they get excited and usually keep going. Involving students in discovering how they learn has been one of the most powerful motivational tools I’ve found. The points illuminated here are valuable. I have also found that acknowledging a student whose work may be less than perfect, yet improved is a huge teaching tool. I teach middle school orchestra. The ensemble knows aurally who the “strong” players are…That does not always translate into knowing who the hardest, most persistent workers are. We have discussions about why practice at home is needed, how much time do we have to reach mastery before the performance date… It leads to some rich reflections. Thank you for sharing this article. Wow. This may be one of your best, Jenn. The way you model reflection on your own practice is powerful and motivates me to do the same. I have shared and will be sharing this post. I believe I will return to this one. May even include it in my staff handbook! I think one part of the research that gets missed is the work of Michael Tomasello and joint attention and joint intentions. Our school uses this as a way to establish the student as the one who determines the focus for their learning and the teacher’s role as one who follows into it. I think the challenge in most situations is teachers are trying to find the “thing” that will develop the student interest and motivation rather than never stepping in to save the student (basically). Like, our students choose texts to read and then read them together in small groups. The teacher is expected to do nothing but make sure kids are following the rules for the group. When kids get to a part of the text they don’t understand, they must try to find ways to solve it. Only after they have shown they collaborate well and have tried together a couple strategies to resolve it can the teacher finally interject to suggest a strategy. This is how we teach everything. There are no “lessons” in the traditional sense. If students are unmotivated, we facilitate them identifying why and how to change that (we do this at the classroom level and admin). It’s not the easiest pedagogical model to implement. It can be frustrating as a teacher and it doesn’t totally solve student motivation. We still struggle there to a degree (our high school has 27% IEPs, 19% ELL and all on average enter reading at a third grade level), but it is different because it puts the “how do we motivate students” question onto the students themselves. Sorry this was so long! I had a hard time condensing ? Thanks for sharing this. Here’s something else that I’ve found is really effective for a lot (but not all) students in my 6th grade Language Arts class: I use small group instruction all the time. Like, 20 minutes of each 60 minute class is small group instruction. I do this 2-4 times each week. While the rest of the kids are working independently or in their own small groups, I pull a small group and work through the assignment with them. We sit together, we chat, we talk about the assignment, and it gives me a chance to provide not only academic support, but also that “something extra” where I get to make a connection and give really specific comments and feedback. I rotate through my groups each week and at this point in the year, the kids pretty much know when it’s their turn. It’s funny because if I deviate just a bit, some of the students are like, “Hey, I though it was my turn… Aw, man!” And I have to say, Ok, I’ll get you tomorrow. Whether they need the academic help or not, it’s about so much more than that. This article was fantastic!! Many things you said resonated with me because I’ve often thought the same thing, especially with extrinsic rewards. It’s like we think we have to give students a “thing” to work for. I believe students lose sight of what they are doing and once they get the “thing” they are too consumed with earning the next “thing” then they are with the process of learning. We are training students to work for “things.” Which I admit always shocks me if how they “work” because many kids can get these items outside of school. Occasionally I’ve overhead a student say “I got that at home!” Or mumble I got better stuff than that at home!” And I quietly chuckle because I think to myself… nope you can’t fool this kid! Thank you for this article. It’s great food for thought and could potentially change our learning environments if we have the courage to do so. Change is hard but it must happen even if it’s unfamiliar or uncomfortable or we will continue to lose our students and wonder why. We can blame parents, technology, students, the generation, etc.. But until we look upon ourselves and our practice, we will remain where we are. I want to not only agree with Laurie (in the comments) that this is “one of your best” but I think it is your best. I have taught motivation at workshops for years and some of these are tenets I teach. Much of it comes from the great motivators of our time. Well done. I hope more teachers read this and take note and start practicing it. re Carrots, Sticks, Jolly Ranchers…Another possiblility: “Here are 12 math problems to do. Do any 10 of them”. THAT, I believe, is real choice. Re student relationships…I don’t think one can overestimate the value of meeting&greeting each student at the door at beg. of every class. You’re instantly rewarded with a ‘pulse’ on your students before even starting class– who is joyful, who is sad/teary, who is angry, who is pals with whom, who has s/t to share +++. I submit it’s a Gold Mine!…even though you also have 6 other things that need to be done at that very same time. Finally, this is a superb article & site in every respect, Jenn! My compliments. Bkgnd… I taught HS students for 20+ years and JBYAM am also a NBCT. I think there is a lot of motivational power in complex collaborative tasks which lead to performance, where students face the deadline of ‘showtime’, are accountable to their peers and get the genuine feedback of a live audience. I’ve blogged about one such project taking my 5th graders all the way from online research to the creation of a living museum of the Ancient Greek Agora. Check out From Research to Re-enactment, or 55 Kids in Sheets on my blog. This is a great post, Penny. I couldn’t agree with you more about the “showtime” aspect when it comes to motivation. That pressure can really spur kids to produce much better end products. Thanks so much for sharing this! Thanks for your thought-provoking articles! I love this story, Tomoko. It’s hard to fight that urge to reward, but I think your instincts were right on track. It helps to have research to back it up! Thanks for sharing your story. As a kindergarten teacher, I completely agree with the idea that building a positive relationship between teacher and student is an important part of motivation. However, I found it interesting to read that extrinsic rewards actually hamper motivation. As a school that uses PBIS (Positive Behavior InterventionStrategies) I need to rethink if the rewards motivate certain students. I also need to help students see who they can improve the things they can control. Hey Gill. I think that’s part of the reason I wrote it. A lot of it is stuff we know, but there’s just so much stuff in our heads, so many things we’re trying to remember, that sometimes the fundamentals completely slip away from us. I’m so glad you liked it. This is a great article. I think these processes also work if an administrator needs to keep a teacher motivated as well. Hi jennifer, i’m amazed at the amount of work you’re doing. Great work! I too was once a teacher and am retired now. I’ve got twin grandsons who are in middle school now and am worried as one of them comes home without completing his work in a lot of subjects. Is he demotivated? his parents are worried too as both of them are above average in their class and i simply can’t understand why he doesn’t complete his work. The more we talk about it the more he gets angry and clamps up. I’m from Maldives. I live separately but visit them twice or thrice a week. This message is to Sameera encourage that your grandson to get connected or a close relationship with the teacher these will make him feel motivated and also making him to solve all his problem with the teacher. Moreover your grandson should also try to have study partner which will help him in completing the problem he faces. This post interested me right away because I am currently a senior in college to become a math teacher. With that, I have put myself out there to gain experience before actually student teaching. Right now I am an undergraduate TA for a college preparation to calculus math course and I find a lot of students are not motivated in discussion. So I try to think of ways to encourage them to work hard and think about the overall concept, but I it is hard to find ways it relates to them on a personal level. Maybe I need to research the mathematics more but I was hoping someone might suggest a good resource for that. For instance why do college students care about Domain and Range? I’d like to be able to make the material more interesting and relevant to them I’m just not sure it’s possible with this certain area of mathematics. And if it’s not, then what do you suggest that may help motivate them in this context? two fantastic but serious books. I think with some aspects of learning, the trick is to step back and look at bigger-picture motivations about why students would be interested in the material. For domain and range, specifically, it’s hard to get non-math-nerds particularly excited, but when you discuss the possibilities that this knowledge and skills can give them, it can really grab their attention. For example, I am an artist and art teacher, yet I use math ALL the time; calculating how many supplies I need for a certain number of students, the percentage that my clay projects will shrink in different kiln firings, of course budgeting, assessing student scores, etc. I care about math because of how it is relevant to my core interests. I once had an AP art student who didn’t care at all about our assignments because she felt they were irrelevant to her, but then I found out that she wanted to be a cake decorator, and set her to 3-D projects centered around that. All of the students still had to cover the same material, but whereas one might make a painting about it, another might make a sculpture, another a charcoal drawing, etc. If the material WAS a painting, then the subject of hers could be a cake design, with the idea that she was presenting a custom design to a potential client she really wanted to impress- that way she was still learning the painting techniques, but was also very motivated to do the project well. She still wasn’t passionate about painting, but saw it’s relevance and found motivation. Of course there are many, many students I never figured out how to reach, but that has been the most useful trick I have found so far. I hope it helps! I found the article to be just another “blame the teacher” article. There’s no way to 100% successful 100% of the time. I teach high school English, and what I’ve learned is that some students simply don’t want to learn. They are only in school because the law requires them to be there. Yes, I’ve worked at motivating those students, and I’ve been successful with some. However, this article clearly states that the only person who has any control of learning is the teacher, and that’s just wrong. I hope no first year teacher reads this article. No argument there. But you know what, it can be fun to try! I like your positive attitude, I liked the article as well. Of course there will always be challenging students to motivate, but the only person we can control is ourselves and if we are committed to encouraging them, these are realistic things to try. They may not work, but better than throwing our hands up! This is one of the only sites out there I see really questioning how things are done (in a respectful way) and providing answers. Regarding number 1 it is why I’d love to see “Listening” added as a skill for teachers to learn in college training. I have a post coming on this at ProsperousTeachers.com. When I worked in sales we NEEDED to know about our customers to best match them up with how to help them. We were trained to listen closely. This is a learnable skill that can be improved. The benefits would be huge. 1. speak for 2 minutes a day with a particular student who although does well in some skills is more challenged in others. 2. Provide specific details regarding areas of improvement and encouragement for other areas through a “growth mindset”. 3. Give my students a choice (within their assignment) this week. 4. Continue to make material relevant to their lives: I try to do this each class (in some way or the other), but I will be more aware of this when planning my lessons. After reading this, I realize I have done a lot of things wrong! Working in the PE department as an aide, my job is to help educate the importance of physical fitness and help the PE teacher with games that keep us physically active and burn calories at the same time, we also learn sportsmanship and new games. I see people being chosen last for a team and others not interested in playing due to lack of ability. I try to encourage those, but tend to draw myself to the active ones who are doing the correct thing. I need to work more on the teaching part so those un-athletic kids feel more of a part of the class. Wow jennifer, another brilliant post on such a relevant topic, no matter what you teach. During the reading I was thinking about the word curator, as I think this is exactly what you do with research information. You curate them for your readers. To my surprise (or not!) , At the end of the post , u used the same word! It was Like the “cherry on the cake” to me. I appreciate the straight forward way you present your content. It really motivates me to keep reading and get until the end. Like a good movie you cannot stop watching and anxiously expect to a great end. And you succeed to do that! I’m so glad you liked it, Serena! Thank You Jennifer! I was reminded that student motivation is a difficult issue to overcome, however we can always keep trying new strategies. Your list of “how we can do better” was both informative and relevant. I really appreciate the opportunity to learn about new strategies. I can relate to what I did early in my career vs. what I want to do now – now that I know better 🙂 Thank you! You’re so welcome, Rob! We are all a work in progress. Again, another fabulous podcast that touches on an aspect of the classroom which sometimes gets overlooked in the midst of the dust of to do lists and content mastery, etc. for students. Your five questions are like a “wake-up” tonic and a clear reminder about what is really important in helping our students achieve success and confidence. Developing a relationship with each and every student is so vital but also something that has to be started from DAY 1! Your candid sharing of experiences and reads from the blog are a further proof of the task that lies ahead of us! And that is to continue focusing on these 5 basic approaches and stay with them because research and experience have led to these findings. Thank you for providing us with these enrichments. All the best.